Controversial Nollywood figure, James Ikechukwu Esomugha, well known as Jim Iyke has announced the signing of a deal with two outfits in Africa for the viewing of his reality television programme, Jim Iyke Unscripted, by the two stations. The recently delivered actor by a pastor at Prophet TB Joshua's Synagogue Church of All Nations (SCOAN) disclosed this via his twitter page some hours ago. The new contract will see him provide footages of his reality TV show to Ifactory and OHTV. 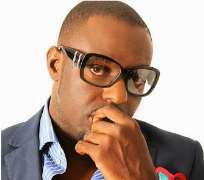 He also announced that the stations will air the seasons two and three of Jim Iyke Unscripted, while the shoots will commence in November.
" Just penned the contract for Seasons 2 & 3 of 'Jim Iyke Unscripted' with Ifactory and OHTV. Shoot commence November. We can't stop. Untamed 4 Christ. lol," Jim Iyke wrote.